Many institutional global asset managers are constrained by the need to invest in long-only strategies with zero or minimal leverage. This means that their strategies are often highly correlated to "the market" (usually the S&P500 index). While it is difficult to minimise this correlation without applying a short market hedge, it can be reduced by investing in non-equities based ETFs. These strategies usually possess an infrequent rebalance rate, often weekly or monthly, but sometimes annually. Thus they differ substantially from a classic intraday stat-arb quant strategy, but are often nevertheless fully systematic in their approach. The current version of QuantStart's open-source backtesting and live trading software, QSTrader, did not have native support for portfolio rebalancing until last week. Instead users were required to determine their own rebalancing logic and build it into the Strategy and PositionSizer classes themselves. In this article a basic fixed proportion equities/bonds ETF mix strategy is presented to demonstrate the new functionality of QSTrader. The strategy itself is not novel—it is an example of the classic "60/40" equities/bonds mix—but the rebalancing mechanic within QSTrader allows significantly more flexibility than this. It should provide motivation to try some interesting long-only ETF mixes. The strategy simply goes long in both ETFs at the first ending day of the month after commencing, such that 60% of the initial capital is invested in SPY and the remaining 40% is invested in AGG. 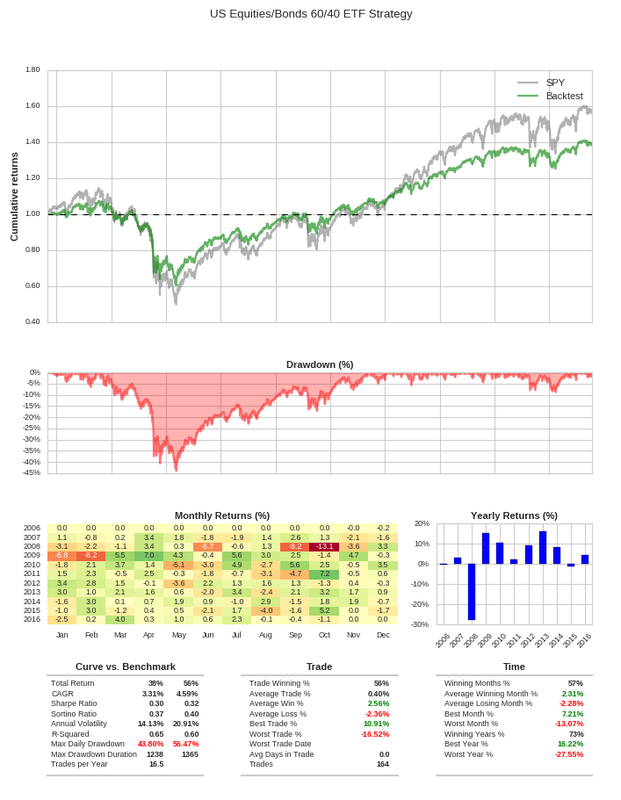 At every subsequent ending day of the month the portfolio is fully liquidated and rebalanced to ensure that 60% of the current equity is used for SPY and the remaining 40% used for AGG. Note that the full code can be found at the bottom of the article. I will only display snippets here. In addition, this strategy is actually a full example in the QSTrader codebase, which can be executed from a fresh install of QSTrader, assuming the data has been obtained separately. There are two new components required to make this monthly rebalance logic work. The first is a subclass of the Strategy base class, namely MonthlyLiquidateRebalanceStrategy. The second is a subclass of the PositionSizer base class, namely LiquidateRebalancePositionSizer. Determine if the current day is at the end of the month. The second method is _create_invested_list, which simply creates a dictionary comprehension of all tickers as keys and boolean False as values. This tickers_invested dict is used for "housekeeping" to check whether an asset has been purchased at the point of carrying out subsequent trading logic. This is necessary because on the first run through of the code the liquidation of the entire portfolio is not needed since there is nothing in it to liquidate! a liquidation signal on the first allocation. The core logic is encapsulated in calculate_signals. This code initially checks whether this is an end-of-month day for the current OHLCV bar. It then determines whether the portfolio has been purchased, and if so, whether it should liquidate it fully prior to rebalancing. This wraps up the code for the MonthlyLiquidateRebalanceStrategy. The next object is the LiquidateRebalancePositionSizer. It is easy to see how this can be expanded to have any initial set of ETFs/equities with various weights. At this stage, while not a hard requirement, the code is set up to handle allocations only when the weights add up to 1.0. A weighting in excess of 1.0 would indicate the use of leverage/margin, which is not currently handled in QSTrader. The main code for LiquidateRebalancePositionSizer is given in the size_order method. It initially asks whether the order received has an "EXIT" (liquidate) action or whether it is a "BOT" long action. This determines how the order is modified. If it is a liquidate signal then the current quantity is determined and an opposing signal is created to net out the quantity of the position to zero. If instead it is a long signal to purchase shares then the current price of the asset must be determined. This is achieved by querying portfolio.price_handler.tickers[ticker]["adj_close"]. Once the current price of the asset is determined, the full portfolio equity must also be ascertained. With these two values it is possible to calcualte the new dollar-weighting for that particular asset by multiplying the full equity by the proportion weight of the asset. This is finally converted into an integer value of shares to purchase. Note that the market price and equity value must be divided by PriceParser.PRICE_MULTIPLIER to avoid round-off errors. This feature was described in a previous post and I won't dwell on it here. The final component of the code is encapsulated in the monthly_liquidate_rebalance_backtest.py file. The full code for this is provided at the end of this article. There is nothing "remarkable" in this file compared to any other backtest setup beyond the specification of the ticker_weights stock weighting dictionary. I'd like to once again thank the many volunteer developers, particularly @ryankennedyio, @femtotrader and @nwillemse, for giving their time so freely to the project and producing some great features. While the backtest shares a similar Sharpe Ratio of 0.3 compared to 0.32 for the benchmark, it has a lower CAGR at 3.31% compared to 4.59%. The underperformance compared to the benchmark is due to two factors. Namely, that the strategy carries out a full liquidation and repurchase at the end of every month generating transaction costs. In addition the AGG bond fund, while cushioning the blow in 2008, has detracted from the performance of SPY in the last five years. This motivates two avenues of research. The first involves minimising transaction costs by avoiding a full liquidation and only rebalancing when necessary. This could be set as some form of thresholding whereby if the 60/40 split deviates too much from this proportion it is necessary to carry out a rebalance. This is in opposition to a rebalance carried out every month irrespective of current proportionality. The second involves adjusting the ETF mix to increase the Sharpe Ratio. There are a vast number of ETFs out there, with many portfolios beating the benchmark a posteriori. Our task is obviously to decide how to construct such portfolios a priori! The current implementation of QSTrader only supports rebalancing of long-only portfolios with fixed initial weights. Therefore two necessary improvements are to ensure that portfolios with short weightings via margin are supported as well as allowing dynamic adjustments of portfolio weightings through time. In addition QSTrader will need to support rebalancing at other frequencies including weekly and yearly. Daily rebalancing is harder to support as it involves having access to intraday market data. However it is a planned feature. Despite the current lack of weekly or yearly rebalancing, the monthly rebalance is extremely flexible. It will allow replication of many long-only strategies currently in use by large asset managers, under the assumption of availability of data. Many future posts will be devoted to such strategies and, as with this post, they will all contain the full code necessary to replicate the strategies. LiquidateRebalancePositionSizer object to work correctly. is determined and then BOT or SLD to net the position to zero.